Installing a single font on a Mac is a simple process. Double clicking on the font will open it into Font Book, which will give you the option of installing the font. Clicking on "Install Font" will copy the font into your local fonts folder, which is located within ~/Library/Fonts. However, doing this has two drawbacks. The first is that only one font can be installed at a time using this method and secondly, these fonts will only be accessible to the user that installs them. The method used in this guide will allow you to mass install as many fonts as you want using one command, regardless of whether they're in multiple subdirectories and will allow any user on the Mac to access them. Let's get started. 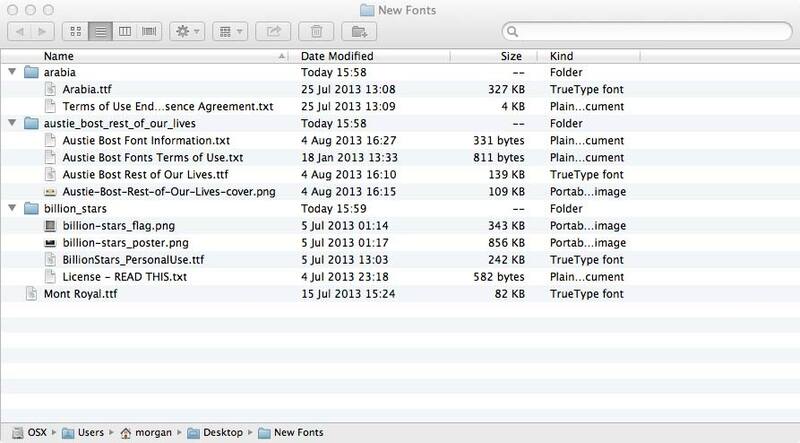 Login to the local administrator account on the Mac and create a new folder on the Desktop named "New Fonts". You can do this by control clicking on the Desktop and choosing the "New Folder" option. Copy and paste all of the fonts you want to install into this folder. It doesn't matter if the fonts are within subfolders as the command we'll use shorty will look inside these folders. As you can see from my folder structure, I've got a few fonts within subfolders with additional text documents. I downloaded these fonts from Da Font. Once you're happy that all of your fonts are within the "New Fonts" folder we can open Terminal. Terminal can be found within the /Applications/Utilities folder. To install all of our fonts we'll need to copy them into the /Library/Fonts folder. Copy and paste the following command into Terminal followed by enter. The above command was adapted from a command found on Stack Overflow by Nahuel Fouilleul. You may find that some fonts didn't install. This may be because they're .OTF fonts. If this is the case you'll want to run this command as well as the one above. If you open Font Book, which is located within the Applications folder, you'll be able to see that your fonts have been installed.